Gortatyne, later to become Linfield, was situated in the 17th century in the "Golden Vale" amidst the one and two room mud-wall cabins of native Irish and Catholic cottiers and laborers. An Archaeological inspection reported on by Margaret Gowan & Co Ltd Archaeological consultants in 2005 for the O'Sullivan family the current owners of Linfield house notes that the first phase of building on the site of Linfield house appears to be a mid 17th century stone 'Planets' house. This building is likely to have been built for the Apjohn family shortly after they came to Gortatyne after 1650. 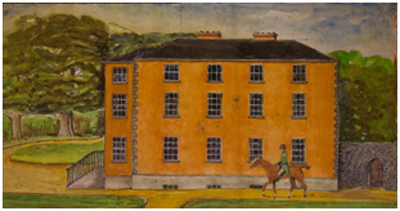 This House was substantially altered in 1792 when Counsellor Marshall Apjohn re-built Linfield House, a fine Georgian Mansion, surrounding and incorporating the earlier masonry structure. Although there were subsequent uprisings in Munster, especially in the last decade of the 17th century when James I hoped to regain the Crown, there is no evidence that Thomas Apjohn or any of his sons participated in any military encounters. Although Thomas was a landlord himself before the Confederate War of this one small piece of land, after the war Gortalyne most likely evolved into a working farm specializing in raising cattle and dairy farming. From documents of the time we can get a picture of what an estate such as Gortalyne may have been like. A farm of 120 Irish acres such as Gortalyne would have supported a herd of 20 to 30 head of cattle which included 8 to 10 dairy cows and two or three oxen. In the summer months, the lands could produce enough pasturage to support the herd or, if not, bullocks could be driven to rented pastures in the area. Hay was grown and stored in barns or haggards to feed the cattle over the winter. The beef herd was self-sustaining-a number of calves were added each year as those fattened and ready for market were sold off at local fairs to herded to the larger markets of Limerick or Tipperary. Besides Thomas and his family, there were a number of others who lived on the farm-a farm agent who was in charge of day laborers, and two or three hired men (and their families) who lived on the farm and provided year-round labor for building and repairs, tillage and pasture, woodland management, ploughing, clearing and hedging, watering and mucking, slaughter and curing, etc. In all there may have been twelve to twenty individuals living on the farm at one time. During harvest there may have been twenty to thirty people working at one time. Besides cattle, Thomas also would have raised pigs, a few sheep, some poultry, and of course horses-both for riding and for draught. Most Protestants of the time ate meat only three days each week, and a herd of fifteen pigs or sheep provided most of the families' meat. A cow would be slaughtered in the autumn and hung to age for the upcoming festive celebrations. In every case, nothing was wasted-tallow, leather, horn and hooves, blood and offal. The dairy operation would have been the responsibility of Thomas' wife (and daughters) and she would have employed a number of dairy maids from the area for the two or three times-a-day milking. Each year Thomas would slaughter a number of unweaned calves for an enzyme contained in their stomachs that was used to make rennet, a necessary component for separating milk into curds and whey. Besides cheese, the dairy also produced butter, way butter and buttermilk, all of which were sold at local fairs or shipped to Limerick for export to Britain. Although he was designated a "Gentleman" in the jury list, Thomas was first and foremost a hard-working farmer and manager of his land, and he and his wife would have passed the skills of farming on to their sons and daughters. When they came of age, his sons sought to lease or purchase land of their own and they became Gentlemen farmers themselves. His daughters would have married by the time they were twenty-one, and they too would have become the heads of farming estates. It was only in the third generation that one of Thomas' grandsons, William, borrowed money to invest in over 1,000 acres and sought to ascend into the class of the landed gentry. The following Lines advert to the uncommon care and Spirit of that patriotic character, of M. M. Apjohn, Of the County of Limerick, Esq., whose Father (yet Living) enjoys the rare satisfaction of beholding the Young trees of his own hand's plantation, now, Grown into magnitude, while the Son studiously Emulates the father's ardour, and, yearly, enriches The sylvan collection, by introducing the most refined cultivation, with care and judgment. Not only long spar'd, but oft planted the tree! Creation's fair culture, and bare fields impeded! To add to that fav'rite spot of our isle! Thy life, virtue-urg'd, seems congenial to run! O'er Juniper's mount what a view dost thou form? How grand are thy prospects-how simple each charm? And Nature, in thee, still enriches the land.